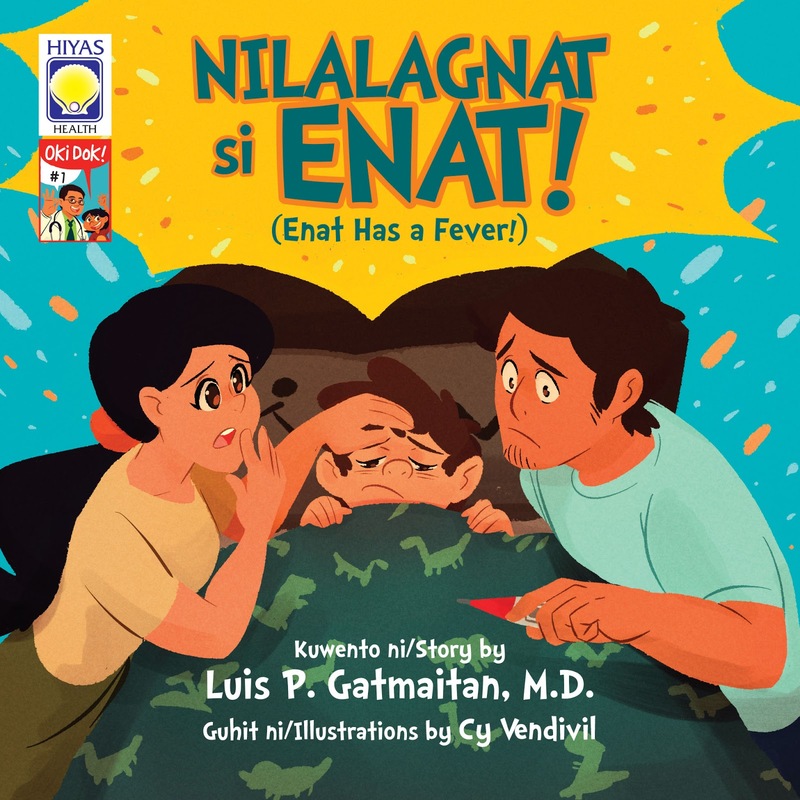 Nilalagnat si Enat is the first book in a new series on health for preschoolers. The Oki Dok series addresses the health and hygiene issues of young children. 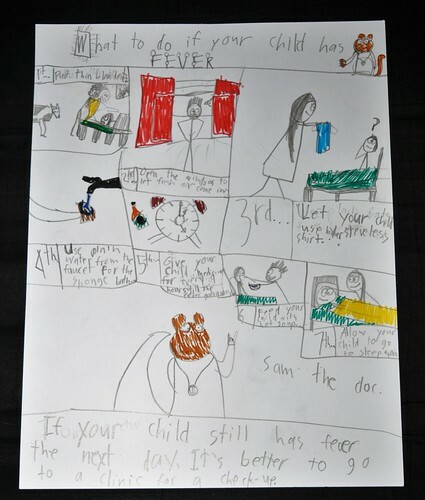 Written by popular children’s book author, Luis “Tito Dok” Gatmaitan. Tito Dok joins young children in discovering the wonders and workings of their bodies. Published by Hiyas, OMF Literature’s children’s book brand, the Oki Dok series aims to help young children grow up active, energetic, and healthy. The series fills a gap in local books on health specially written for preschoolers and those in the early grades. My son Gabi is already 8 years old but this book still works for him. I decided to discuss this as part of his Health Subject. He learned what to do when one has a fever from the story of Enat and I hope he'll be able to apply it in the future. I love how this book debunks the old practices we grew up with when it comes to treating fever. Although these are old practices, there are still people who are doing it (like wrapping a sick person in a thick blanket), it's just hard to detach from our old ways, agree? This book is easy to understand. It is written in Filipino with a parallel English translation which is great for kids who are struggling with Filipino Subject. It is illustrated colorfully, so kids will not find it boring to read especially preschoolers. It is also a great way to raise awareness regarding our health and how to be good stewards of our bodies. Luis P. Gatmaitan is a medical doctor and author of more than 50 books for children and other nonfiction titles. 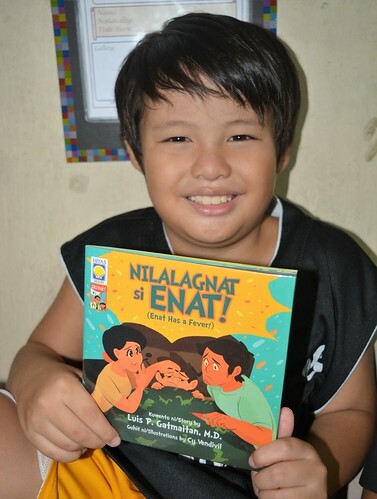 Among the books he has written is the popular health series, "Mga Kuwento ni Tito Dok" which now has 20 titles. His books have been translated into several languages and adapted to musicals, animations, apps, and theater productions. A Hall of Fame awardee of the Palanca Literary Awards, he was also recognized with a Ten Outstanding Young Men (TOYM) Award in 2005 for his contribution to Philippine Literature. Email him at luis_gatmaitan@yahoo.com. Oki Dok#1 Nilalagnat si Enat is available at National Bookstore, OMF Lit Bookshop, Passages, and other leading bookstores nationwide for 80 pesos. The book can also be ordered online through passages.com.ph. For more info, please email hiyas@omflit.com or call (632) 531.43.03. SIZE: 6.5 in. x6.5 in.